AT&T sneakily announced a small batch of new phones this week, one of which is the sequel to the well-received Motorola Atrix--the Atrix 2. Luckily, Motorola was present at CTIA, so I managed to spend some time with their newest super-phone. The original Atrix wasn't perfect. It suffered from a bloated MotoBlur overlay, and the webtop laptop dock wasn't functional enough to warrant an extra $500. But Motorola has really trimmed the fat when it comes to the Atrix 2. The Atrix 2 looks thinner and feels lighter than the original Atrix. Compared to the futuristically angular Photon 4G, the Atrix 2 is a little bland, design-wise. The phone feels less bulky than the Bionic, and the rear of the phone has a nicely engraved back, which makes it more comfortable to hold than the original. The biometric fingerprint scanner is missing, however. Thanks to its dual-core, 1GHz processor, the Atrix 2 is as fast as its predecessor (it feels slightly faster than the Bionic). The overly chunky version of MotoBlur is gone. There is still a MotoBlur overlay, but it looks like the one we saw on the Bionic. I, personally, dislike Motorola's overlays, but at least it's not as overwhelming as it was on the original Atrix. I was surprised (and extremely relieved) to see that Motorola has decided against a pentile display for the Atrix 2. Pentile displays on previous Motorola phones have been the source of fuzzy text and a mysterious blue tint. The Atrix 2 instead has a 4.3-inch gHD display that looks extremely sharp and clear. The blue tint that I've come to associate with Motorola devices (with pentile displays) is gone, and colors look gorgeous. Unfortunately, I was unable to test data speeds on the Atrix 2 due to the lack of a SIM card. 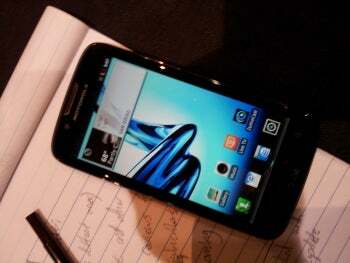 Motorola representatives, however, assured me that the Atrix 2 will take advantage of AT&T's 4G network. At $100 with a new 2-year contract, the Atrix 2 seems poised to be AT&T's big Android hit this holiday season. For the price, the Atrix 2 is a good follow-up to the original, and great for anyone looking to upgrade to a dual-core phone at a reasonable cost.